To be fair, you're not like most people, or even most roadgeeks. TRAFFIC SIGNS AND RELATED WORK. Tomorrow, NLCOG will discuss a status update on the I-69 SIU 15 that is proposed to be routed to the south of Shreveport. I don't expect any major announcements, but it will be interesting to see if a project timeline is discussed. Seems that there's been some rural four-laning, such as the entire length of US 171. Does LA have a general plan or are they just widening roads as traffic demands? Ah, OK. Perhaps I'll create a new thread in general highways about this sort of statewide plan. Please do Illinois has a plan but the best are the links to ongoing projects in Midwest Great Lakes and Ohio Valley. Prior to Altimus’ announcement, southward extension of ARTP remained at a stand still while the federal government decided whether to approve a land swap involving an area of protected wetlands ...“We were informed today by Ben Shultz with Congressman Fleming’s office that the federal fish and wildlife agency has signed off on the land swap,” Altimus said ... 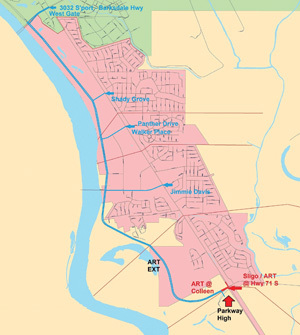 Since 2004, the parish officials worked to extend ARTP south with the hopes of relieving traffic congestion by constructing a parkway for seamless traffic flow from south Bossier to the Benton Road ... Bossier Parish Engineer Butch Ford said the parish now seeks to extend ARTP much further than its original stopping point at Caplis-Sligo Road ... Last month, the jury approved a contract with Denmen Engineering to create two designs to extend ARTP all the way to the future site of Interstate 69 ... “The portion we are looking at first will go underneath I-69, that’s why we are looking at that – to try to give people coming into south Bossier into Bossier City and alternate route. Construction of the long-awaited southern extension of Arthur Ray Teague Parkway is under way, Bossier Parish officials say. The $7.4 million project will extend the parkway from its current terminus at the Bossier City limits and curve behind Plantation Trace subdivision before crossing Red River Wildlife Refuge to connect with Sligo Road. Officials spent more than six years on a land swap agreement with the U.S. Fish and Wildlife Service to acquire a portion of the refuge for the extension. The process required them to purchase adjacent property to the refuge to swap, two acts of Congress to alter the refuge's boundaries and countless meetings between parish and federal officials. The Bossier Police Jury and its staff "jumped through a lot of hoops over the last couple of years to get to this point," Parish Administrator Bill Altimus said. "We are extremely pleased that this project has started along with, I am sure, all of the folks who travel this area daily." Once completed, he said, the project should enhance moving around south Bossier. "The parkway is the future for south Bossier," said newly elected District 1 Police Juror Bob Brotherton, whose district encompasses far south Bossier. If the parkway continues farther to Taylortown, as the Police jury is considering, the roadway might connect with other transportation venues such as the proposed Interstate 69 corridor or even a bridge across Red River into the Port of Shreveport-Bossier, he said. "Wherever transportation (corridors) are, there is business. "» We have to look down the road. Ten years from now, this is going to be very important to south Bossier. It's just going to be a magnet for growth." In April, police jurors hired Denmon Engineering to survey and study further extending the parkway south. Results of the $160,000 study are expected to be released in late December or early January, Altimus said. Construction of the ongoing extension to Sligo Road is expected to take 15 to 18 months, meaning completion in 2013, according to parish engineer Butch Ford. ...there are four significant highway construction projects important for our region. It is important for us to prioritize these projects and then work to secure funding to complete them. As we have done in the past, we will survey our members and ask for their input to help prioritize these four projects: extending La. Highway 3132 to the Port of Shreveport-Bossier, the "Inner City" I-49 connector, a new southern entrance for Barksdale Air Force Base and the widening of the Jimmy Davis Bridge over the Red River. Not surprisingly, I-69 SIU 15, on which a FEIS has not even been completed, is not considered an immediate priority. South Bossier residents get ready. As construction continues on the Arthur Ray Teague Parkway, parish officials are making plans to extend the road further south to Taylortown. On Wednesday (March 21), jurors approved a revised corridor to Highway 527, relocating part of the route further east to accommodate concerns brought before them at last month’s public meeting. Parish engineer Butch Ford said the revision would reduce the cost of the project but could affect more wetlands. A firm cost estimate has not been identified but the parish set aside $2.5 million for right of way acquisition in this year. Arthur Ray Teague Parkway to Sligo Road, $10 million, extending the parkway from its current terminus at the Bossier City limits behind Plantation Trace subdivision and across a portion of the Red River Wildlife Refuge to connect with Sligo Road. Construction started in November and is expected to be complete by the end of the year. Any chance US 165, US 425, and LA 2 can become signed with directional shields from Bastrop to Mer Rouge? I just want to see the faces of the people driving through when you have a road going from Mer Rouge to Bastrop, signed as North, South, and West, all on the same highway. I'm surprised. No directions on those? LA usually has state highway signs with no direction but US highways? Just says US 165/LA 2/US 425... The signs for US 425 that I've seen paired with state routes have no directional banners. I'm gonna take a few photos and send em to the DOTD. If they say that the signs would be confusing, I'll just say that 425 is in La and ark, and 25 is in Georgia. Now that's confusing! There's light at the end of the tunnel for residents who have been looking forward to the Arthur Ray Teague Parkway extension in southern Bossier City. Crews are set to begin paving the first 1/2 mile section of the Sligo Road Extension in the next couple of weeks. "This is the terminus of the city project and it goes south and it'll end at U.S. 71," explains Bruce Easterly, Bossier Parish Engineer. Easterly says the $8 million project to extend the thoroughfare to Sligo Road near Parkway High School is ahead of schedule. "There's another 2 1/2 miles that has to be prepared and the base constructed and everything ready." He adds the extension will help lessen the traffic congestion along Barksdale Boulevard, as well as ease the headache of navigating through this busy section of south Bossier. "You can come on and get on the parkway and the Sligo Road Extension and go on up and hit downtown with no traffic lights." Upon expected completion in January 2013, the extension will curve behind Plantation Trace neighborhood and across the Red River Wilderness Refuge to connect to Sligo Road. There are currently additional plans to extend the Parkway even further south, to Taylortown near Louisiana Highway 527. Six years in the making, the expanded Arthur Ray Teague Parkway will open Feb. 27 with a ribbon cutting at Colleen Drive near Parkway High School at 10 a.m. .... The original dream was to extend the parkway south to Sligo Road, but now the jury sees a need to keep expanding the parkway south to the proposed intersection of I-69 near Taylortown. “When you think long term about the unbelievable amount of people that come out of Red River and Webster Parish into Bossier, and when you look at all the options to move traffic in that area being able to come through and extend the parkway as it was intended, it's going to be great benefit to the parish and city,” said Altimus. This TV video report has some footage of the ribboncutting and of the ARTP extension. I-49 North is almost finished (save for the Inner City Connector segment through downtown Shereveport); I-10 through Baton Rouge is simply a pipe dream since the Perkins Road neighborhoods oppose any widening of the existing route; and I-10 between LCH and the TX border is essentially finished save for the upgraded Calcasieu River bridge (and I-210 buys time there). How do you rank these in terms of having a shot to be completed? I-10 thru Baton Rouge have to be the most head scratching segment of Louisiana's interstates. I agree with you, I dont know how you solve this problem. Just wondering, why is finishing I-49 south is such a major priority in your opinion? I saw a LA 1258 shield in alexandria today. Are they still adding state routes? Because ive never seen this one before. Its on old boyce rd turning south from air base rd at I-49. No jct signs from air base rd (la 498) and I didn't folkow it any further as I was just stopping for gas to make it home to Pineville. 1. Another hurricane evacuation route to Lafayette. 2. A direct freeway to the Port of New Orleans.